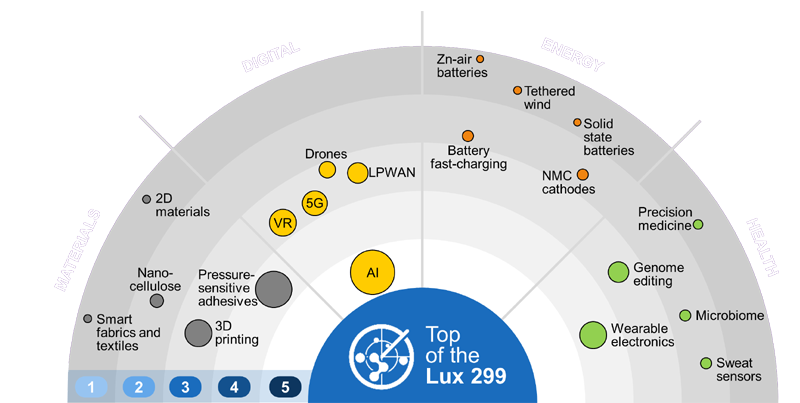 The technologies that have the greatest potential to transform the world over the next decade. Develops a smart home hub that integrates with dozens of third-party devices, such as locks, thermostats, motion sensors, and lights; devices are generally installed into the building's electrical wiring at the point of construction The platform includes building management software that allows ... read more. Produces methanol via direct catalytic hydrogenation of CO2; obtains CO2 from carbon capture and generates hydrogen from water electrolysis Core innovation is process design; catalysts obtained from undisclosed supplier Launched a 5 million liter per year methanol demonstration plant in 2012 in ... read more. Offer hardware to continuously monitor the health and accuracy of a water meter (or any flow meter) using three sensors, cellular communications, and edge processing capabilities; technology finds hidden revenue and meter errors and can use acoustics to identify leaks Utilities recieve the results ... read more. The company was founded by owner and CEO Ole Jensen, former founder of Danish Bluetooth pioneer Digianswer. To date, the company has raised approximately $2.6 million from several angel investors. The company makes real-time, online fluid measuring devices, CatGuard and Tveskaeg, based on nuclear ... read more. The company was founded by Jeremy Goodwin (CEO) and Andy Tong (Strategic Advisor) in 2013; the founders have expertise in corporate development and finance but lack prior domain experience; the company has fewer than 20 employees. So far, the company has raised about $545,000 through multiple seed ... read more. Develops an IoT platform for industries that can be used to connect devices, manage data and applications, and provide analytics; recently pivoted its focus from automobiles to manufacturing industries Claims differentiation in the platform's capability to connect and manage edge devices, as well as... read more. Offers a computer vision software for the factory environment to assess worker activity and develop efficient operational practices Claims that it solves an unmet need in the automated factory by quantifying the efficiency of work and processes that involve employees with real-time information, as ... read more. This is the third article in a series of insights from Lux's participation in the Mobile World Congress (MWC19) in Barcelona. We've previously highlighted the hype surrounding 5G, from fake 5G that does not conform to international standards to 5G that is still far from commercial deployment. Two ... read more. Transit X is designing a high-capacity personal rapid transit (PRT) system that uses an overhead monorail and suspended pods capable of carrying up to four adult passengers Pods are electric vehicles that can generate their own power from solar panels or recharge wirelessly on locations on the track... read more. Offers a connected home energy monitoring system with embedded processing power to perform load disaggregation Uses current transformer (CT) sensors to gather electricity measurements directly from the home electricity panel a million times per second Continues to target the consumer market directly... read more. We're sorry, there are no results for this search. Need help with your project or have a question about our research? Get in touch with us and one of our analysts will contact you shortly. © 2004-2019 Lux Research, Inc. All Lux Research content is intended only for consumption by Lux Research clients; redistribution is prohibited and copyright is strictly enforced. All material is based on information obtained from sources believed to be reliable but no independent verification has been made, nor is its accuracy or completeness guaranteed. All material is published solely for informational purposes and is not to be construed as a solicitation or an offer to buy or sell any securities or related financial instruments.